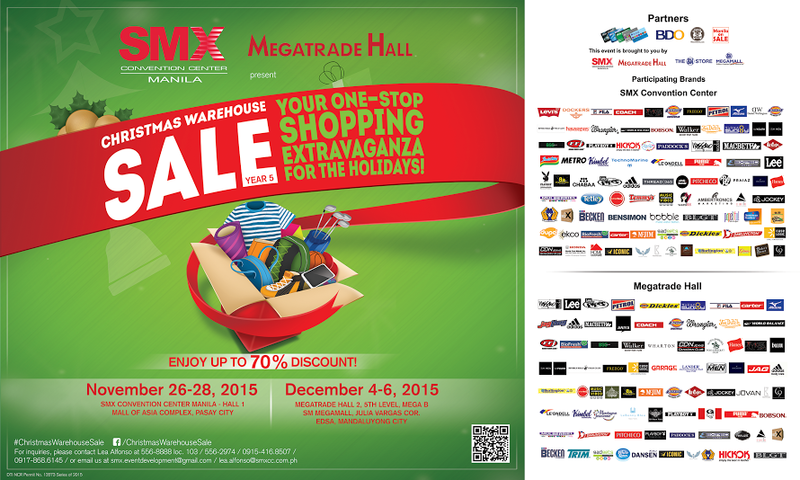 Spend your last minute Christmas shopping at SMX Convention Center Manila Saturday, November 26 – 28 and at the Megatrade Hall on Friday to Sunday, December 4 – 6! Score only the best brands from fashionable clothing, novelty items, unique accessories, coolest gadgets, sporting apparel, cosmetics, latest footwear to creative gift ideas and many more up to a whopping 70% discount! Entrance to the sale events are FREE. This event is brought to you by SMX Convention Center and Megatrade Hall in partnership with BDO, SM Advantage Card, When in Manila, and Manila on Sale.